MRO Japan, who operates the aircraft maintenance facility at Naha Airport, began their aircraft maintenance business January 7. On January 9, the company invited various media outlets to come and see the business in operation. They plan on receiving 20 planes for servicing through the end of March.In the future, the company is looking to start receiving aircraft for maintenance from the wider Asian region. 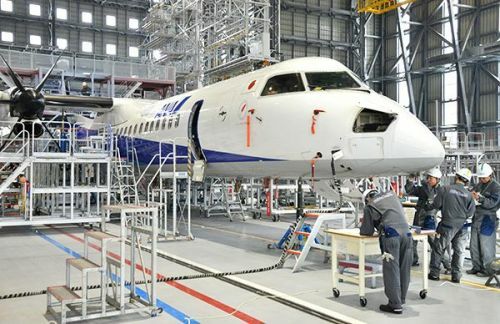 The company has plans to hire locally within Okinawa.On January 7, the first day of business, MRO Japan brought into their hangar a DHC8-400 from All Nippon Airways (ANA). The maintenance staff progressed through various tasks that included inspecting the condition of the cables that move the landing gear in and out of the aircraft, and replacing the aeronautical beacons on the tips of the wings. On January 9, the hangar welcomed a Boeing 373.Maintenance periods can be as short as 3-4 days, but can extend to as long as a month in some cases.There are plans to receive a small aircraft in February for painting, before taking in a larger aircraft in March for the same purpose.MRO Japan relocated to Naha Airport from Itami Airport in Osaka.The company previously serviced around 100 planes each year, and they plan on receiving a similar number of aircraft each year. The majority of the aircraft they have serviced have come from the ANA group.The company plans to take advantage of their prime location in the center of Asia, and moving forward will look to service more planes from countries outside of Japan. MRO Japan is also looking to hire locally, with the expectation of having 30% of their 230 employees be natives of Okinawa.